A rare video has surfaced with important interviews and testimony concerning George Adamski’s claims of having filmed flying saucers and having met with their extraterrestrial occupants. The video gives credence to Adamski’s claims of having secret meetings with European dignitaries including Pope John XXIII and members of the Pentagon to secretly brief them about extraterrestrial life. 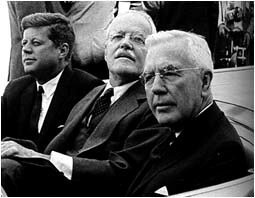 Among the more controversial of Adamski’s claims is that he privately met with President Kennedy in late 1961. Adamski claims he passed on a message from his extraterrestrial contacts about a future world crisis. If true, Adamski and his extraterrestrials played an unknown role in advising Kennedy on the best strategy for future events such as the Cuban missile crisis. The video contains a number of interviews with individuals that personally knew Adamski and were privy to the unique circumstances of his alleged contacts with extraterrestrials. Desmond Leslie, a former Royal Air Force pilot, Irish Lord and cousin to Winston Churchill, related his own investigation of Adamski. Adamski claimed he secretly visited Pope John XXIII and passed on a message from the extraterrestrials to him shortly before the Pope's death. Leslie was subsequently able to confirm Adamski’s did meet Pope John XXIII and was given a papal gold medallion for his service. One of the most powerful pieces of evidence confirming Adamski’s claims of regular meetings with extraterrestrials occurred at the Silver Spring, Maryland home of Madeline Rodeffer on February 26, 1965. Rodeffer worked as a secretary for the US Air Force and was physically present when Adamski sighted a bell shaped flying saucer at her home. She saw it for approximately 10 minutes and at times could see human looking figures through the portholes. Adamski filmed the saucer using her camera when she was unable to film it herself due difficulties from a recovering broken leg. Prior to the sighting, she saw three young men arriving in an Oldsmobile who told Adamski to get ready to film the flying saucer. Adamski told Rodeffer that they were part of a human looking contingent of extraterrestrials living among humanity. The film was subsequently analyzed by three independent photo/film image experts. One was William Sherwood, who at the time worked at Eastman Kodak as an optical physicist. He traveled to Rodeffer’s home and was able to determine that the flying saucer in the film was not a model but approximately 27 feet in size. Sherwood subsequently concluded that the film was genuine. Another visual imagery expert was Colonel Colman Von Kevieszky who worked at the time with the United Nations audiovisual department. He also traveled to Rodeffer’s home to investigate the video and confirmed that it was genuine. Finally, Bob Oechsler, who worked as a physicist and NASA mission specialist, also independently concluded that the film was genuine and depicted a flying saucer. Other witnesses were interviewed who said they saw flying saucers in association with Adamski’s visits. One of these was Major Hans Peterson from the Danish Air Force who had also worked at the Danish NATO exchange office in Washington DC. Peterson had arranged lectures for Adamski in Scandinavia and personally saw flying saucers during Adamski’s visits. Adamski’s claim of having an ordnance pass which gave him access to U.S. military facilities was confirmed by William Sherwood. Sherwood himself had previously worked for the U.S. Ordinance Department and possessed his own ordnance pass. Sherwood saw Adamski’s Ordinance pass thereby giving credence to Adamski’s claims that he secretly briefed the Pentagon about his extraterrestrial contacts. According to Major Peterson, the message contained advise on a world crisis to occur in about a year that was later revealed to be the October 1962 Cuban Missile crisis. If true, the contents of the message may have helped Kennedy develop the right strategy for dealing with a conflict that could easily have escalated into a Third World War. The extraterrestrial message, apparently, also contained an invitation for Kennedy to meet with them in California. While there is no direct independent evidence supporting Adamski's claim, there is important circumstantial evidence that President Kennedy accepted the invitation. According to claims in a rare video, George Adamski met with President Kennedy at the White House in late 1961 and passed on a letter to him from human looking extraterrestrials. 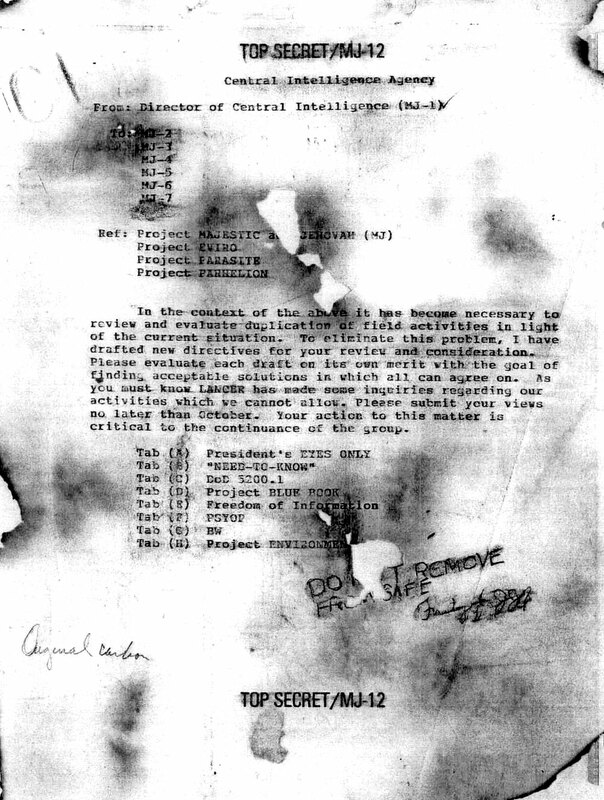 In addition to giving advice on the Cuban missile crisis, the alleged letter also contained an invitation for Kennedy to meet with the extraterrestrials. I still remember his [Adamski’s] White House story. He told me that he had been entrusted with a written invitation for President Kennedy to visit one of the space people’s huge mother ships at a secret airbase in Desert Hot Springs, California, for few days. In order to keep this visit absolutely secret, Adamski was to take the invitation directly to the White House through a side door. Still glowing with excitement and smiling happily, he explained how the row of cars in which his taxi was traveling had to stop because of a red light just in front of this particular door where a man he knew - a spaceman, he said - was standing ready to let him in. Adamski later learned that Kennedy had spent several hours at the airbase after having canceled an important trip to New York, and that he had a long talk with the ships crew, but that he had not been invited for a flight." The quality of witness testimonies, photos and film evidence presented in the rare video (see part one above, of this investigative series), all lead to the conclusion that George Adamski was largely telling the truth about his flying saucer sightings and contacts with human looking extraterrestrials. There is however no direct physical evidence that Kennedy met with the extraterrestrials Adamski was in contact with. There is, however, circumstantial evidence that such a meeting did happen, and it influenced Kennedy’s policies on space cooperation and UFOs. The first set of circumstantial evidence concerns Kennedy’s certain knowledge of UFOs and human looking extraterrestrials. A former flight steward and loadmaster on Air Force One, Bill Holden, confirmed that Kennedy was aware of UFOs and human looking extraterrestrials. In a June 2007 interview, Holden explained that in June 1963, while flying to Germany on Air Force One, he placed two newspapers before Kennedy where UFOs were clearly pictured on the front page. The unqualified nature of Kennedy’s response revealed his knowledge that both UFOs and human looking extraterrestrials were real. This is circumstantial evidence that Kennedy was either briefed or did meet with human looking extraterrestrials as Adamski claimed. A second set of circumstantial evidence concerns a leaked document that claims that Kennedy knew, while serving in the U.S. Congress, about UFO crashes and the recovery of alien bodies. As a former Naval Intelligence officer, Kennedy was deemed reliable to receive such highly classified information. While the authenticity of the document in question, "Interplanetary Phenomenon Unit Summary," is disputed, the U.S. Army did finally acknowledge through FOIA responses that the Interplanetary Phenomenon Unit did at one time exist and was abolished in the late1950s. The helps support the legitimacy of the leaked document. Furthermore, the claim that Kennedy had knowledge of UFO crash retrieval operations is supported by British UFO researcher Timothy Good. In his book Need to Know (2007), Good cites a reliable military source that Kennedy was taken to see the alien bodies from Roswell. 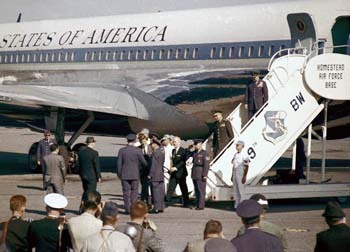 "Around 1961/1962 President J.F. Kennedy expressed a wish to see the alien bodies associated with an alien crash-site. He had obviously been informed of their existence and wished to see for himself the evidence…According to information received, the alien bodies were taken to Florida when Kennedy went to see them [at] a medical facility." If the leaked document and/or the military whistleblower are accurate, then President Kennedy was aware of the reality of extraterrestrial life and technology. If Kennedy was so interested in seeing dead alien bodies during the early part of his administration, then it is very plausible that he would have accepted an invitation to meet with live extraterrestrials as Adamski claimed. The third set of circumstantial evidence concerns President Kennedy secretly traveling to an undisclosed Air Force base to watch UFOs. "did fly out to an air force base to personally watch an unidentified bogie track from an aircraft under tight security which got no press coverage sometime in 1962." If Kennedy did travel to a secret airbase in California to meet with live extraterrestrials, then the incident described by Cooper offered at least one opportunity for such a meeting to take place. Kennedy's alleged meeting with extraterrestrials, would have made him the second U.S. President to meet extraterrestrial ambassadors in the California desert. The first allegedly occurred on February 20, 1954 with President Eisenhower at Edwards Air Force base. So far, the circumstantial evidence reveals that President Kennedy had been briefed about UFOs and extraterrestrial life earlier in his political career. Also, Kennedy knew that some extraterrestrials looked similar to humans. Finally, Kennedy secretly traveled to one or more undisclosed Air Force bases to view UFOs in action in 1962. The circumstantial evidence considered so far, does make plausible Adamski’s claim that Kennedy secretly traveled to California to meet with extraterrestrials sometime in 1961/1962. More circumstantial evidence for such a meeting is found in Kennedy’s initiative to get the USSR and USA to cooperate in joint space and lunar missions, and to release classified UFO files. In 1963, President John F. Kennedy launched a ground breaking initiative to get the USSR and USA to cooperate in joint space and lunar missions. In the background of this publicly announced initiative with powerful Cold War implications was a more secretive attempt to release classified UFO files. Leaked documents reveal that Kennedy instructed the CIA to release classified UFO files as part of the cooperative space effort with the Soviet Union. If Kennedy had succeeded, there would have been joint space mission to the moon and eventual public release of classified UFO files by both the US and USSR. President Kennedy’s assassination quickly led to the abandonment of his joint moon mission with the USSR, and ended his administration’s effort to force the CIA to release classified UFO files. Finally, in a field where the United States and the Soviet Union have a special capacity - in the field of space - there is room for new cooperation, for further joint efforts in the regulation and exploration of space. I include among these possibilities a joint expedition to the moon. In putting into effect his commitment for joint space missions, President Kennedy issued National Security Action Memorandum No. 271 on November 12, 1963 with the subject header: "Cooperation with the USSR on Outer Space Matters:"
In addition to the Confidential National Security Action Memorandum, Kennedy issued a more highly classified “Top Secret” Memorandum to the Director of the CIA. [I] have instructed James Webb to develop a program with the Soviet Union in Joint space and lunar explorations. It would be very helpful if you would have the high threat [UFO] cases reviewed with the purpose of identification of bona fides as opposed to classified CIA and USAF sources…. When this data has been sorted out, I would like you to arrange a program of data sharing with NASA where Unknowns [UFOs] are a factor. This will help NASA mission directors in their defensive responsibilities. I would like an interim report on the data review no later than February 1, 1964. It’s important to note that CIA Memorandum refers to the National Security Action Memorandum issued to Webb on the same day. Even though the leaked Top Secret Memorandum to the CIA has not been officially acknowledged (it has been ranked medium-to-high level of authenticity), there is no question about the legitimacy of the National Security Action Memorandum (NSAM). 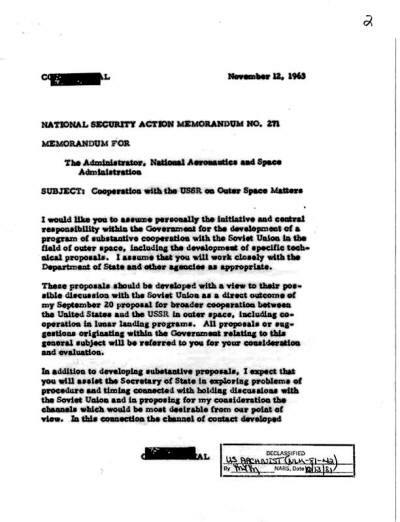 The November 12, 1963 National Security Action Memorandum clearly showed that Kennedy had decided to cooperate with the USSR on “Outer Space Matters.” If Kennedy had been warned by about the dangers of future conflict with the Soviet Union and/or with extraterrestrial life, then sharing classified UFO files was an obvious way to implement the National Security Action Memorandum. At the time of Kennedy's initiative, the USAF was conducting a public investigation of UFO cases and made many available under Project Blue Book. UFO cases that had national security implications, however, were investigated under a separate reporting system. Joint Army Navy Air Publication (JAMAP) 146 created the Communications Instructions for Reporting Vital Intelligence Sightings (CIRVIS system) that required all civilian and military pilots in the US and Canada to report UFO sightings. UFO sightings with national security implications were investigated under the CIRVIS system. These UFO cases were classified and their release was an offense under the Espionage Act. Less important UFO sightings were not classified and made available through the Blue Book reporting system. The separate investigation systems for UFO sightings was eventually disclosed in 1979 by a document released through the Freedom of Information Act. In 1963, President Kennedy was therefore seeking the release of classified UFO files collected through the CIRVIS reporting mechanism, and not those made available through Project Blue Book. In conclusion, National Security Action Memorandum No 271 and the associated Top Secret CIA Memorandum issued on November 12, 1963 are evidence that Kennedy firmly linked cooperation with the USSR on “outer space matters” with the release of classified UFO files. For undisclosed reasons, Kennedy was convinced that the CIA was the lead agency for ensuring the release of UFO files. This suggests that the USAF and the other military services were secretly required to release UFO files reported through the CIRVIS system to the CIA. 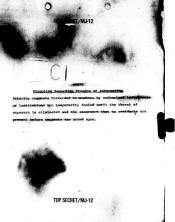 Kennedy was therefore directly confronting the CIA over its ultimate control of classified UFO files. Ten days after the two November 12 memoranda were issued, President Kennedy was dead. 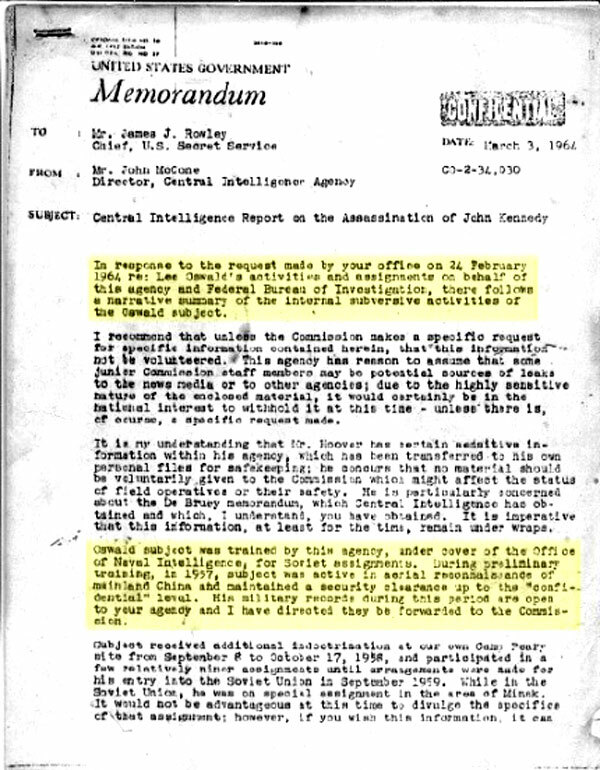 In addition to the two Presidential memoranda cited earlier in Part III above, another leaked document shows the extent to which Kennedy was prepared to cooperate with the Soviet Union in declassifying UFO files. The aim was to avoid the risk of a mistaken military confrontation over UFOs. 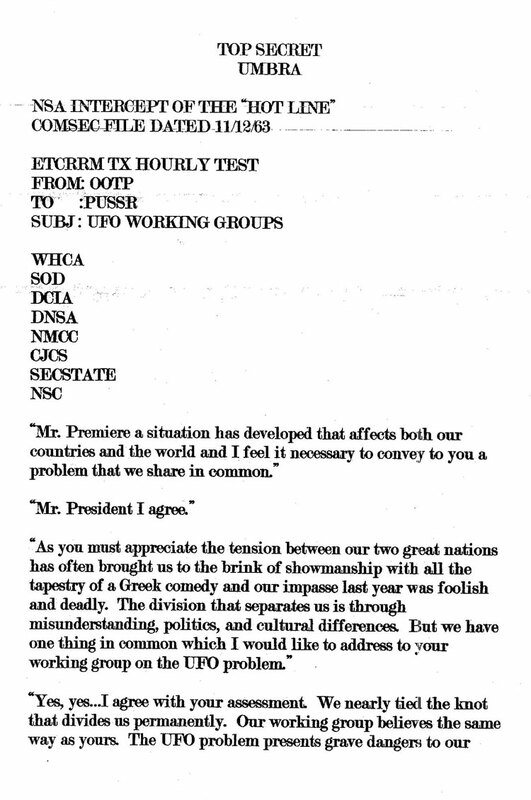 The document (below images) is allegedly a Top Secret NSA intercept of a “Hot Line” conversation between President Kennedy and Soviet Premiere Nikita Khrushchev dated November 12, 1963. Kennedy and Khrushchev discussed the importance of their respective UFO working groups to deal with the UFO problem to avoid the risk of future conflict. While the NSA intercept has not been conclusively determined to be authentic (it has been ranked medium-to-high level of authenticity), it is consistent with the November 12 National Security Action Memorandum 271 titled: “Cooperation with the USSR on Outer Space Matters." The risk of mistaken identification of UFOs leading to an accidental nuclear war was also allegedly considered by NATO at the same time. According to Robert Dean, a retired Command Sergeant Major who worked at NATO headquarters from 1963-1967, in 1964 NATO issued a Cosmic Top Secret document dealing with the threat posed by UFOs being confused with a nuclear first strike by the Soviet Union. Titled simply “The Assessment,” Dean said that it was feared that mistaken UFO sightings could start an accidental nuclear war. Dean’s statement validates the content of the alleged Hotline transcript and gives support to its authenticity. He thought also of the political achievement of all these things, that then they would begin to trust each other much more. After the Cuban missile crisis, his trust with President Kennedy was raised very high. He thought that it's possible to deal with this President, he didn't think that they could be friends, but he really wanted to avoid the war, so through this co-operation they could sojourn their thoughts on these achievements. 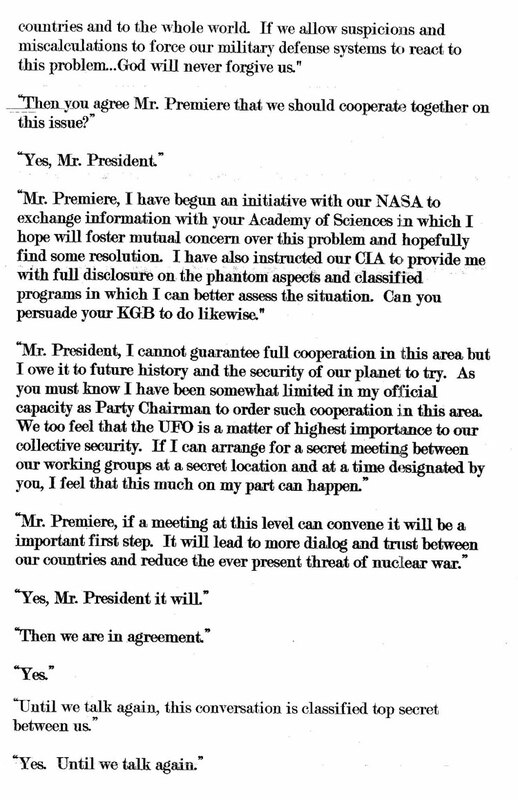 The November 12 National Security Action Memorandum revealed that Khrushchev had only just accepted Kennedy’s offer. The Hotline conversation shows that Kennedy and Khrushchev reaching agreement on a broad range of issues concerning sharing UFOs information and joint cooperation in space. The dating of the Hotline conversation is consistent with the agreement reached in the background over this period between Kennedy and Khrushchev. This gives more confidence that the Hotline document is genuine. President Kennedy & Governor Connolly shot in Dallas. Ten days after the breathtaking events of November 12, Kennedy was assassinated. The most documented source of a CIA link to the Kennedy assassination was the investigation by Jim Garrison, District Attorney of New Orleans. Garrison found much documentary evidence to demonstrate that Lee Harvey Oswald was involved in a conspiracy led by Clay Shaw. Garrison discovered that Shaw had an "extensive international role as an employee of the CIA." While Garrison was unsuccessful in earning a conviction against Shaw, Garrison was partly vindicated in 1979 by the House Select Committee on Assassinations. Historians who view the CIA as complicit in Kennedy’s assassination point to the CIA’s role in covert operations in Vietnam as the reason why the CIA wanted Kennedy’s removal from office. Col Fletcher Prouty, in his well documented book, JFK: The CIA, Vietnam and the Plot to Assassinate John F. Kennedy, reveals that Kennedy was attempting to end the CIA’s influence over covert operations. Chief among these was the escalating U.S. involvement in Vietnam that Kennedy wanted to end and was why he was assassinated. There is, however, a more compelling reason for why the CIA wanted Kennedy’s removal for office - the CIA’s role in controlling UFO information. President Kennedy’s bold attempt to cooperate with the Soviet Union in joint space and lunar missions is a historic fact. What is not well known is that this required extensive sharing of UFO information to prevent any misunderstandings over UFOs sightings that could spark military hostilities and jeopardize space cooperation. Documents confirm that on November 12, 1963 Kennedy and Khrushchev had agreed on steps to share UFO information precisely for this reason, and Kennedy identified the CIA as the lead U.S. agency to implement the process. Kennedy’s assassination by a hit team organized by a CIA asset, Clay Shaw, directly implicates the CIA. CIA officials complicit in the Kennedy assassination were likely acting to preserve the CIA’s institutional power and influence through its control of UFO information. There was, however, another secretive organization that was even more threatened by Kennedy’s efforts to share UFO files with the USSR – the MJ-12 Special Operations Group. President John F. Kennedy’s desire to cooperate with the Soviet Union in joint space and lunar missions led to him asking the CIA to release classified UFO information to the Soviets. On November 12, 1963, Kennedy issued two Presidential Memoranda and participated in a Hotline discussion with Soviet Premier Nikita Khrushchev to finalize details for future joint space missions. Most importantly, agreement was reached on the need for sharing both countries most sensitive UFO files. Both Kennedy and Khrushchev were concerned that a mistaken identification of UFOs could lead to nuclear war and jeopardize space cooperation. Kennedy’s Memorandum to the Director of the CIA to share UFO files was relayed on to the James Jesus Angleton, the CIA’s chief of counterintelligence, who controlled access to the nation’s most sensitive UFO files. 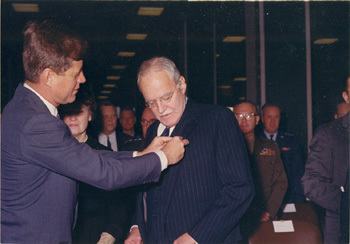 In responding to Kennedy’s request, Angleton followed a secret directive from former CIA Director Allen W. Dulles to ensure that under no circumstances would any U.S. President or his staff gain access to classified UFO files. Earlier in this series I referred to a Top Secret NSA intercept of a “Hot Line” conversation between President Kennedy and Soviet Premiere Nikita Khrushchev dated November 12, 1963. 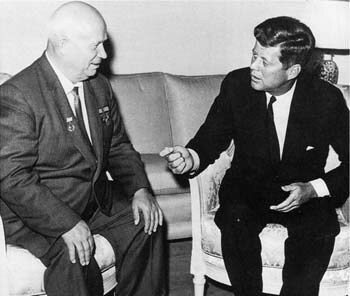 Kennedy and Khrushchev discussed the importance of their respective UFO working groups dealing with the UFO problem to avoid the risk of future nuclear conflict. Other (leaked) government documents refer to an “MJ-12 Special Studies Project” as the name of the project housing the U.S. UFO working group. 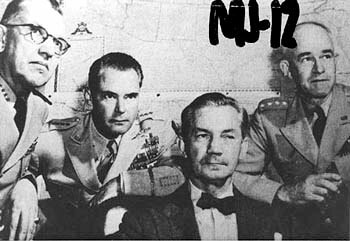 For example, on July 14, 1954 a memorandum was sent by President’ Eisenhower’s National Security Advisor Robert Cutler to U.S. Air Force Chief of Staff, General Nathan Twining to schedule a meeting for the MJ-12 Special Studies Project briefing. 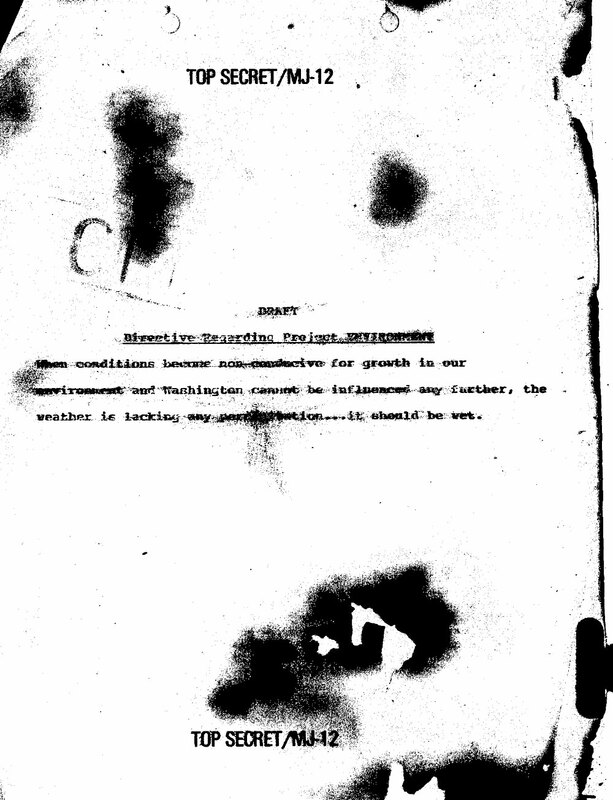 The Cutler-Twining memo (below image) was found at the National Archives in 1985 and is the most authoritative documentary evidence so far that the name of the U.S. UFO working group during the Eisenhower and Kennedy administrations was associated with the MJ-12 Special Studies Project. Another leaked document that has been investigated and found to be authentic, more specifically names the U.S. UFO working group as the MJ-12 Special Studies Group or more simply, MJ-12. A top secret document was allegedly rescued from a fire burning the remainder of James Angleton’s files after his death on May 12, 1987. A former counterintelligence colleague of Angleton, who claimed to be present at the burning, sent it on June 23, 1999 to Timothy Cooper, a UFO researcher best known for his role in making public leaked MJ-12 documents (see cover letter). regarding the history of these eight new directives concerning the MJ-12 program. 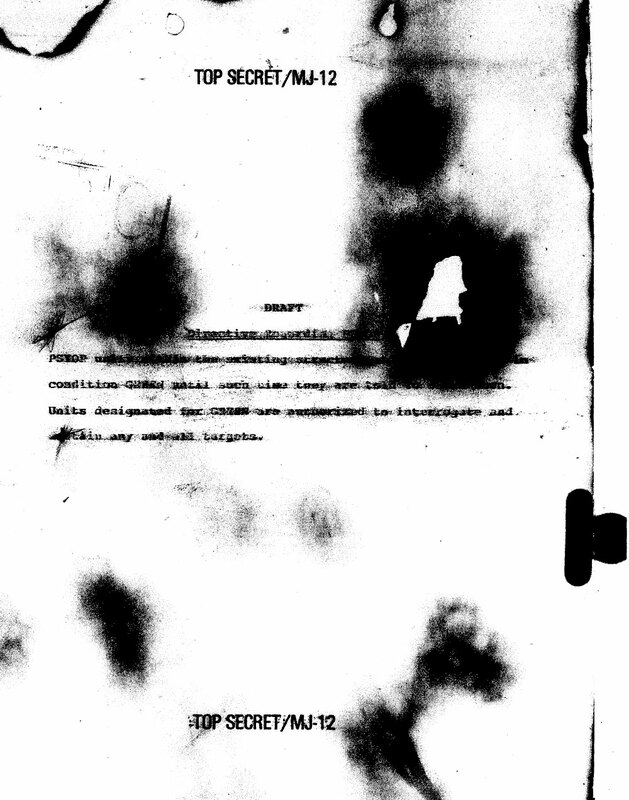 "sensitive files that would connect MJ-12 to JFK's murder. Nixon's special classified executive order (SCEO) ordered all MJ-12 documentation purged and destroyed. This one was not. This carbon copy is the only link to MJ-12 and don't expect any more in the future. Everything is now on computers and there is no existing paper trail to my knowledge..."
The redactions were done by the Majestic Documents team to protect the identity of the author. 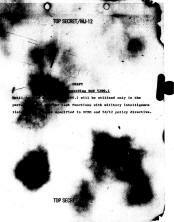 The burned document (below images) dates from the Kennedy era and has the characteristics of a government document. 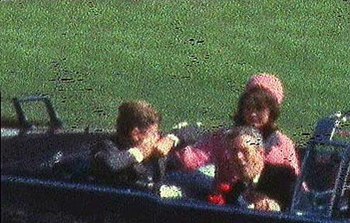 If its contents are accurate, it provides smoking gun evidence of a direct link between Kennedy’s efforts to gain access to UFO information and his assassination. The nine-page "burned" memo, stamped TOP SECRET/MJ-12, is named because it was snatched from a fire before being destroyed, which is why it is discolored and disintegrating. Unlike many of the Majestic documents, this one is an original carbon with an Eagle watermark characteristic of government work, but so far forensic laboratories have been unable to trace it. The memo is from the Director of Central Intelligence (MJ-1) to MJ-2, MJ-3, MJ-7, in reference to Project MAJESTIC and JEHOVAH, Project EVIRO, Project PARASITE, and Project PARHELION. Although no dated is given, its content directly suggests the month of September. The year is estimated to be in the early 1960s and is still under investigation. "As you must know LANCER [code word for JFK] has made some inquiries regarding our activities which we cannot allow." "Designated MJ projects should be held in readiness to perform SPIKE and HOUSE CLEANING operations in major population centers in the event conventional methods are not satisfactory. Specialists from MK-ULTRA and ARTICHOKE are hereby activated to conduct DOMESTIC." Logically, this paragraph refers to UFO retrieval operations. The authenticity of these directives seems beyond question: original onionskin papers, proper forensically verified red ink of the time period, and rare "CI" (counter intelligence) stamps. The classified Top Secret document with MJ-12 codeword access is a set of directives from the Director of the CIA who simultaneously headed the MJ-12 Special Studies Project, to six other members of the Project. 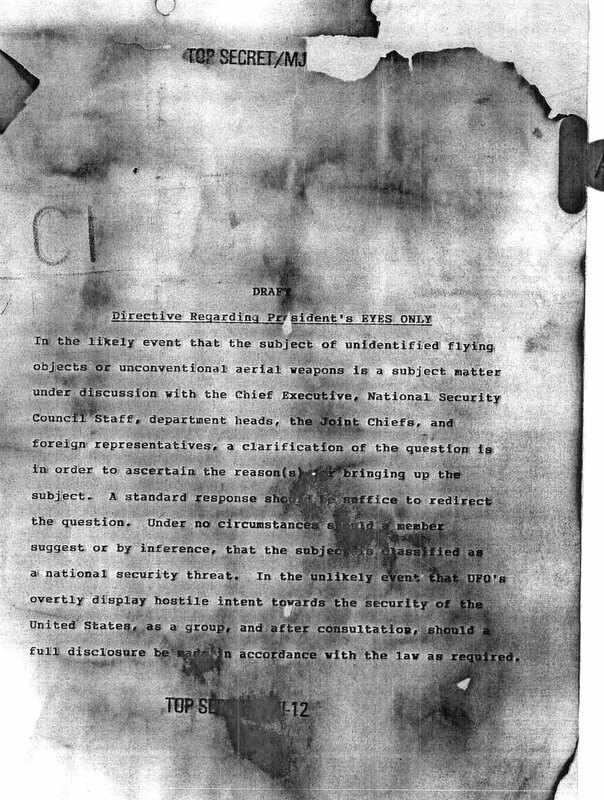 While the burned document has no date of issue, the authority of the writer and the political context indicates it was written shortly after Kennedy had issued his June 26, 1961 National Security Action Memorandum (below image) to the Director of the CIA who at the time was Allen Dulles. This appears to be a reference to the June 26 NSAM review Dulles was ordered to undertake. 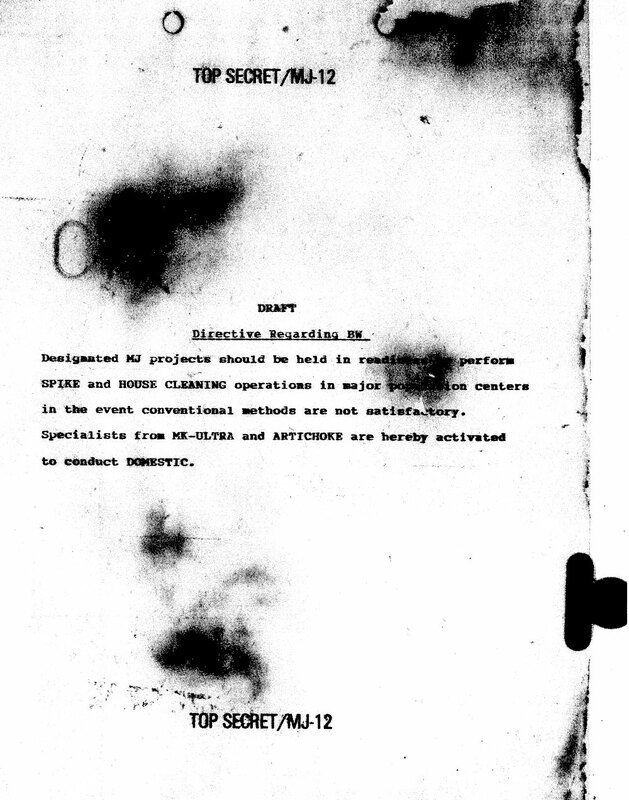 The burned document appeared to be a draft for a series of MJ-12 directives from Allen Dulles, who knew his time as DCI was limited due to the April 1961 Bay of Pigs fiasco. He needed an answer from the other MJ-12 members by October, a month before he was to retire as DCI on November 29, 1961. 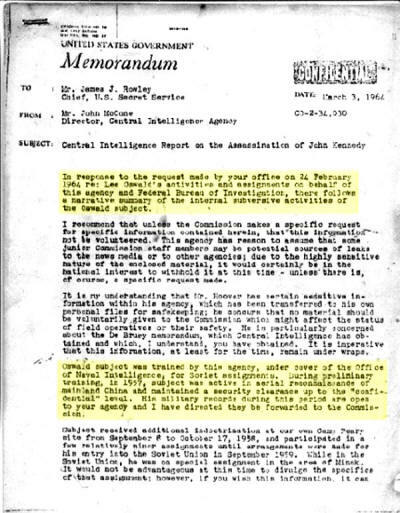 Basically, Dulles secret directives proscribed Kennedy’s National Security team from gaining access to the most sensitive UFO files possessed by the CIA and MJ-12. Most important was what appeared to be a cryptic assassination directive in case senior Washington officials did not cooperate with MJ-12. While the response of other MJ-12 members is not known, subsequent events indicate that Dulles secret set of directives was approved. 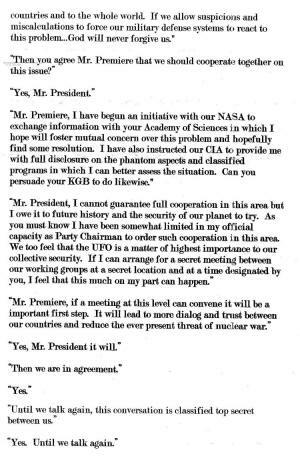 On November 12, 1963, President John F. Kennedy had reached broad agreement with Soviet Premier Nikita Khrushchev on joint space missions and sharing classified UFO files. This required both leaders instructing their respective UFO working groups to share information. Kennedy did this through a Top Secret Memorandum to the Director of the CIA to share UFO files with NASA and the USSR. 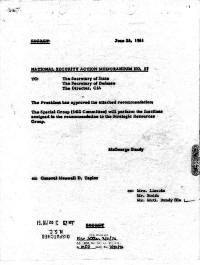 In responding to Kennedy’s request, Angleton followed a Top Secret/MJ-12 set of directives. The MJ-12 “assassination directive” was later implemented by Angleton in response to President Kennedy’s November 12, 1963 request to the CIA to release classified UFO files. Earlier in this investigative series (above reports) I discussed the burned document and its genesis during the final months of Allen Dulles tenure as Director of the CIA. 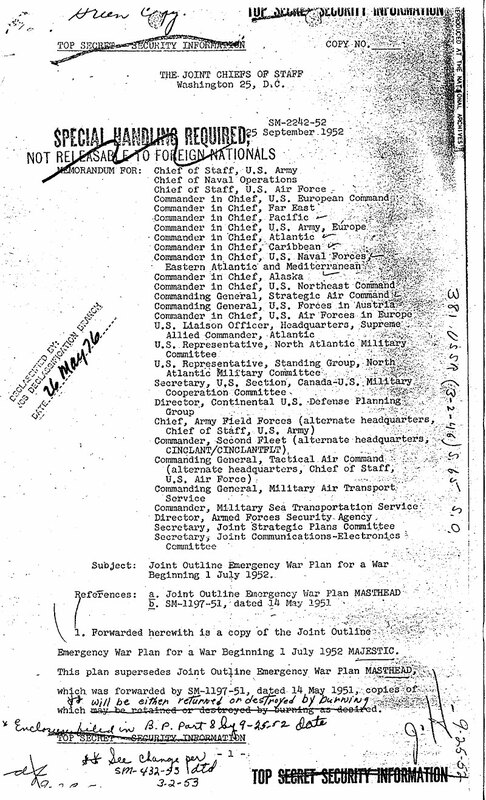 Dulles and other MJ-12 members were responding to Kennedy’s initial effort on June 28, 1961 to be fully briefed on MJ-12 intelligence operations and UFOs. 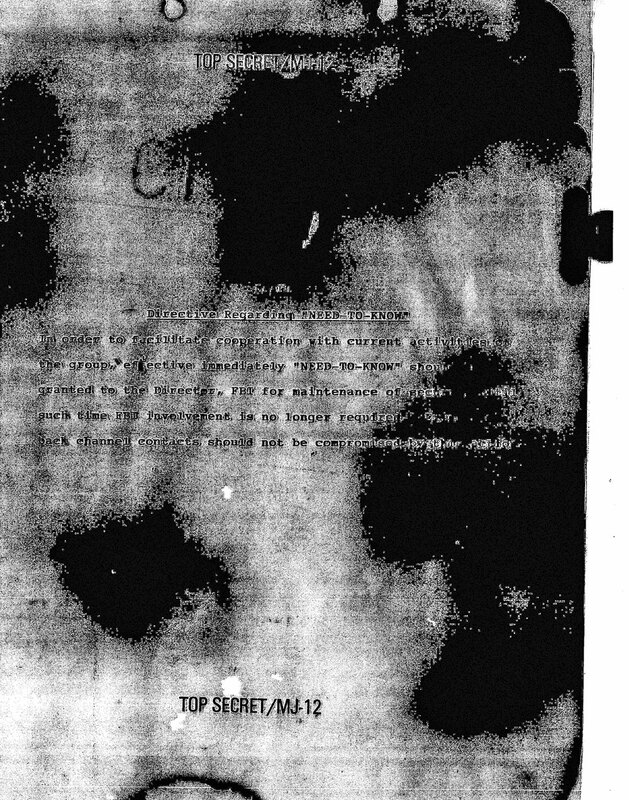 Kennedy, according to a leaked Top Secret Memorandum titled “Review of MJ-12 Intelligence Operations,” (below image) requested Dulles to give a brief summary. In response and unknown to Kennedy, Dulles drafted a set directives shortly before his November 1961 retirement. Dulles’ draft document was addressed to another six members of MJ-12 requesting comments and their approval. It had clear instructions that under no circumstances would any U.S. President or his national security staff be briefed or given access to classified UFO files. The most damming directive, drafted by Dulles and apparently approved by six other MJ-12 members was a cryptic assassination directive. When conditions become non-conducive for growth in our environment and Washington cannot be influenced any further, the weather is lacking any precipitation … it should be wet. Dr Robert Wood who is the foremost expert in analyzing MJ-12 documents using forensic methods, has concluded that the burned document is an assassination directive. In an interview (below insert) discussing the burned document, he pointed out that the cryptic phrase “it should be wet” originates from Russia, where the phrase ‘wet works’ or “wet affairs” denotes someone who had been killed and is drenched with blood. The codeword ‘wet’ was later adopted by the Soviet KGB and other intelligence agencies, according to Dr Wood. The term “it should be wet” therefore was a coded command to kill someone. In drafting this cryptic directive, Allen Dulles was seeking approval from six of his MJ-12 colleagues, to lay the justification for the assassination of any elected or appointed official in Washington DC whose policies were “non-conducive for growth”. The cryptic directive was a pre-authorization for the assassination of any U.S. President who could not “be influenced any further” to follow MJ-12 policies. Kennedy’s 1963 efforts to end the Cold War, cooperate with the USSR on joint space missions, and share classified UFO files with the USSR created a final showdown with MJ-12. 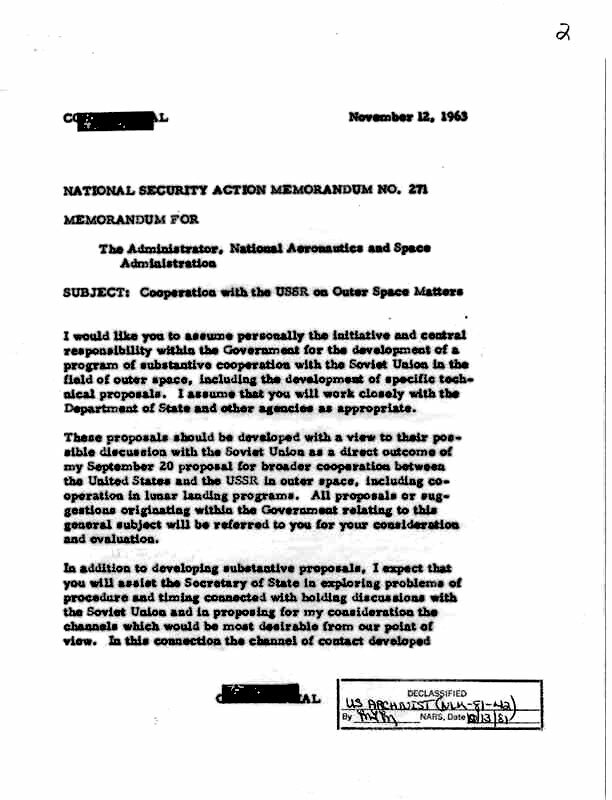 The trigger was Kennedy’s agreement with Khrushchev on November 12, 1963 on space cooperation that led to the National Security Action Memorandum (NSAM) - above image - instructing the new Director of the CIA, John McCone, to share UFO information with NASA, and due to NSAM 271 (below image), with the USSR. Kennedy’s explosive NSAM to the CIA Director was relayed by William Colby, then (Deputy) Chief of the CIA's Far East Division, to James Angleton in CIA counterintelligence. It was Angleton who had the authority to implement Kennedy’s NSAM. "Response from Colby: Angleton has MJ directive 11/20/63"
Colby is here acknowledging that Angleton, two days before Kennedy’s assassination, had the MJ directives – the burned document – and would use them to respond to Kennedy’s NSAM. This handwriting directly implicates Angleton in the Kennedy assassination due to the cryptic MJ-12 assassination directive. There is more evidence to directly implicate Angleton in the Kennedy assassination. Lee Harvey Oswald was among a small group of American citizens to have defected to the Soviet Union in 1959. The CIA established a file on Oswald in 1960, but some authors claim that CIA counterintelligence were monitoring Oswald even earlier, and that Angleton was directly involved through an intermediary. An alleged leaked CIA document (below image) also suggests that Oswald was trained by the CIA in 1957 for Soviet assignments. At the very least, as an American defector, Oswald was the responsibility of CIA counterintelligence headed by Angleton. Upon his return to the U.S. in June 1962, Oswald’s activities were closely monitored by CIA counterintelligence. Oswald’s subsequent association with a number of CIA assets including Clay Shaw provided opportunities for Angleton’s counterintelligence to not only monitor, but to manipulate Oswald. Ensuring Oswald’s participation in the Kennedy assassination, no matter how minimal, provided a powerful rationale for preventing a thorough investigation of the Kennedy assassination. As a former communist defector, Angleton and the CIA could persuasively argue that Oswald’s involvement directly implicated the USSR. This allowed the CIA to successfully argue to the Warren Commission, through Allen Dulles who was a member, that a thorough investigation was too dangerous due to the risk of nuclear war. The assassination of President Kennedy directly resulted from his efforts to gain access to the CIA’s control of classified UFO files. 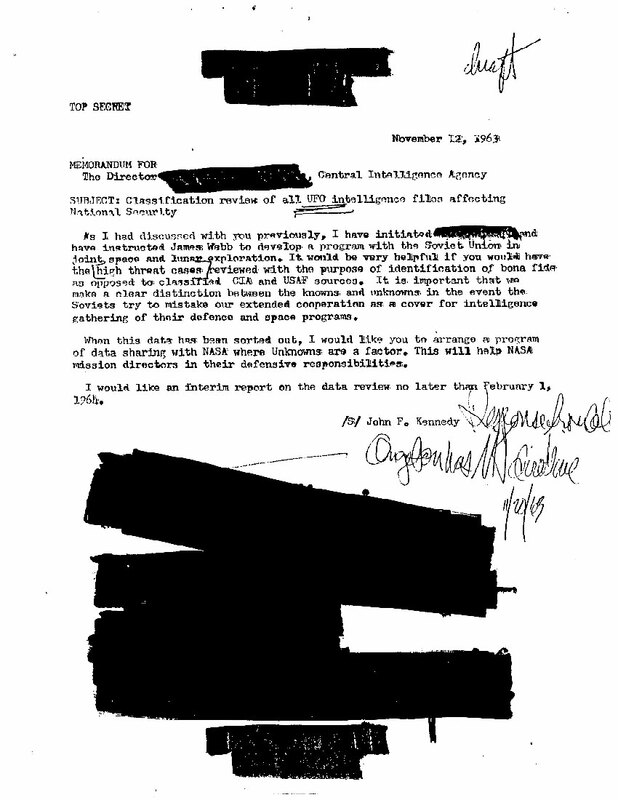 Unknown to Kennedy, a set of secret MJ-12 directives issued by his former CIA Director, Allen Dulles, proscribed any cooperation with Kennedy and his national security staff on the UFO issue. It was Dulles and another six unknown MJ-12 members who sanctioned the directives found in the burned document including a political assassination directive against non-cooperative officials in the Kennedy administration. While Dulles and his six associates pre-authorized the assassination of Kennedy, it was the CIA counterintelligence chief who gave the final orders that culminated in Kennedy’s assassination. In doing so, James Angleton arranged for a communist defector to be involved so as to eventually take the blame and ensure that no thorough investigation would follow by federal or congressional authorities. Documents and facts bear witness to the complicity of former CIA officials in the assassination of President Kennedy. The implications of leaked MJ-12 documents relevant to the Kennedy administration require a thorough public inquiry. 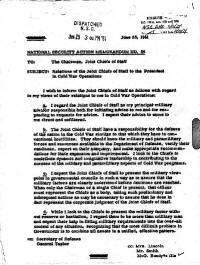 Did Allen Dulles draft Kennedy assassination directive in a covert MJ-12 coup? 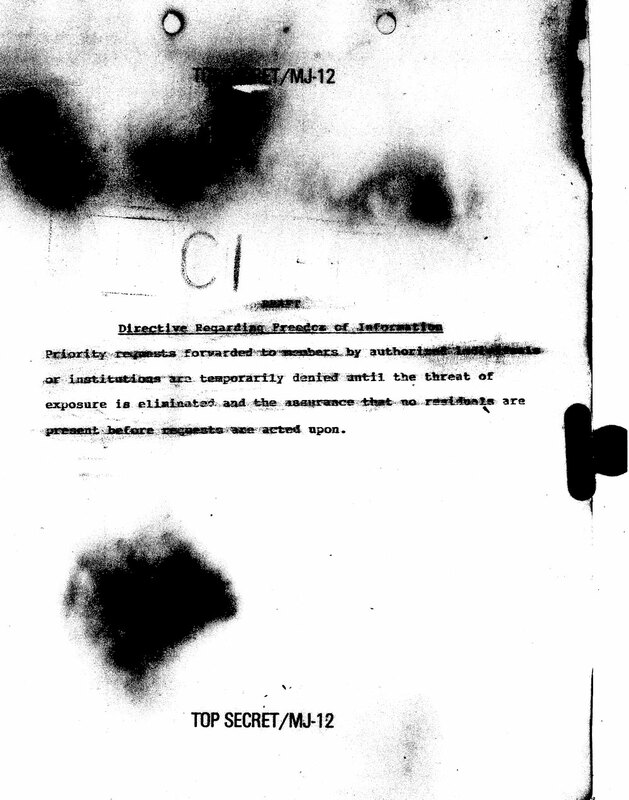 A cryptic assassination directive found in a leaked document allegedly drafted by the Director of the CIA (DCI) was in response to President Kennedy’s inquiries into covert activities of the MJ-12 Special Studies Project. 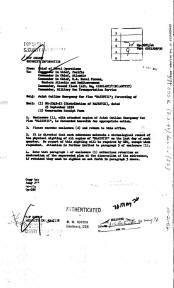 The document reveals that the DCI, at the time of its drafting, was also the head (MJ-1) of a covert group in charge of the highly classified MJ-12 Project. The document contained eight directives describing future MJ-12 policies. The first directive prevented access by the President, his National Security Council staff and Joint Chiefs of Staff to information concerning UFOs. 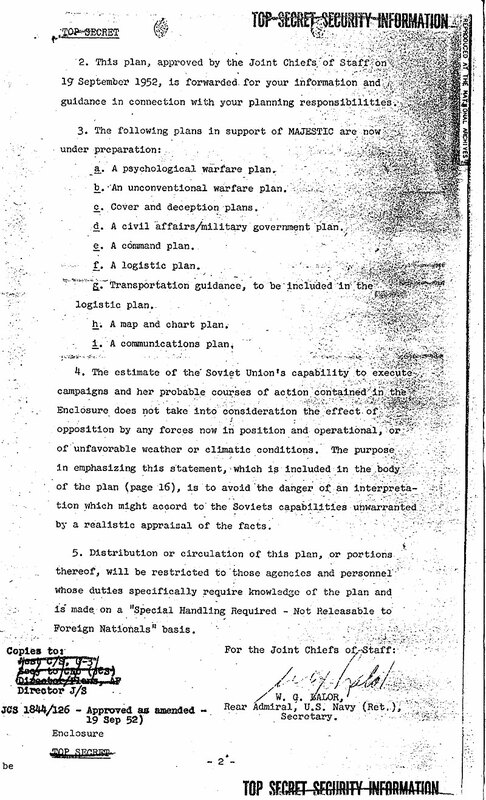 The alleged assassination directive was the eighth directive (below image) and appeared to be a cryptic order to eliminate uncooperative U.S. federal officials. 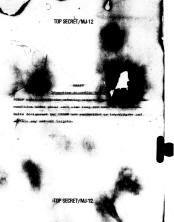 Though the document is undated and unsigned, forensic analysis on the original carbon version dates it to the 1960s. The political context dates it to the first year of President Kennedy’s term. This means that just before he retired on November 29, 1961, outgoing DCI Allen Dulles drafted a document that would deny his superior, President Kennedy, information that had been legitimately requested concerning MJ-12 activities. More importantly, the assassination directive constituted pre-authorization for the violent removal of a sitting President from office in a covert coup d'etat. Dr Bob and Ryan Wood have conducted extensive forensic analysis of the burned document which was received in its original carbon version. It was on government issued watermarked paper and dated to the 1960s. Though the paper has still not been definitively traced to any government agency, it uses similar watermarks to other government documents. 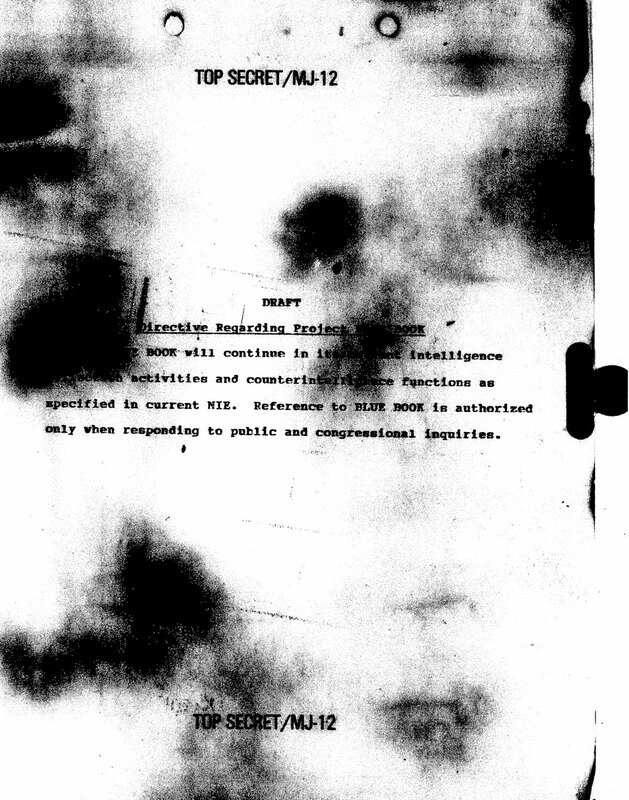 The text of the burned document clearly points to President Kennedy’s inquiries concerning MJ-12 Special Studies Project activities as the catalyst for it being drafted. More significantly, the document says that “continuance of the group” was at stake. 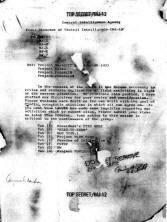 While Dulles name does not appear on the burned document other leaked documents reveal that he drafted it. 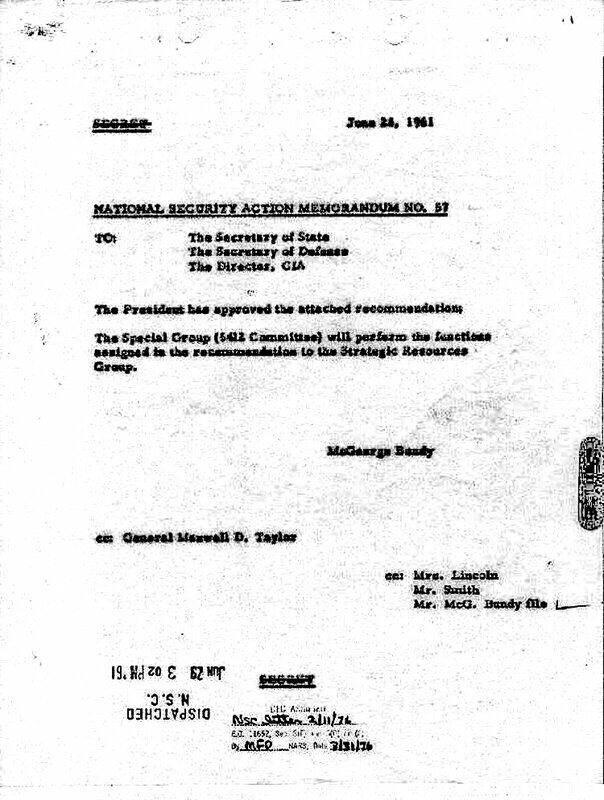 This leaked National Security Memorandum clearly shows that Kennedy in June of 1961, wanted to learn about MJ-12 activities and the relationship with psychological warfare. While the leaked June Memorandum has not been acknowledged by the CIA (it was classified TOP SECRET), other documents from the period support its authenticity. Early in his administration, President Kennedy showed that he desired to restructure the National Security Council and bring all intelligence and psychological warfare activities under direct Executive control. On February 19, 1961, President Kennedy issued Executive Order 10920 which abolished the Operations Coordinating Board. 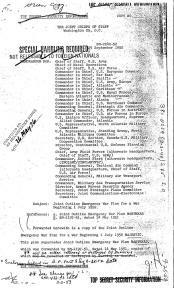 The Operations Coordinating Board was the primary interagency organization responsible for Cold War psychological warfare activities. 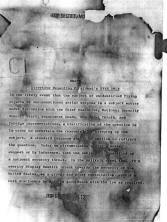 Its responsibilities were handed over to Kennedy’s national security advisor, McGeorge Bundy and the Department of State. President Kennedy’s EO 10920 showed that he desired to gain control over all intelligence activities related to psychological warfare. Abolishing the Operations Coordinating Board shows he was willing to dismantle any government entity in order to bring its psychological warfare operations under the direct control of his national security team. 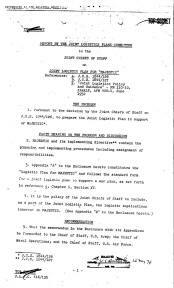 EO 10920 helps substantiate his later June 28, 1961 National Security Memorandum concerning a review of MJ-12 activities that Kennedy had learned involved psychological warfare. EO 10920 also helps substantiate the very real concern expressed by the drafter of the burned document that the future of MJ-12 was at stake. 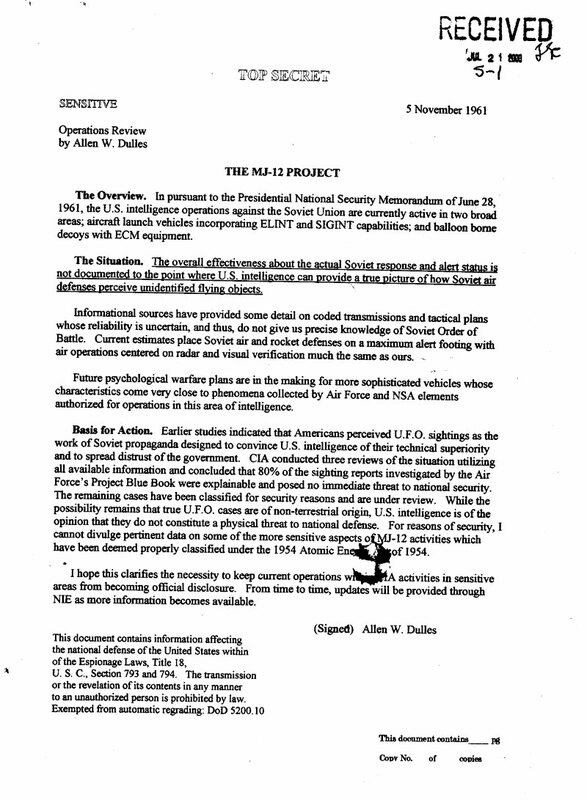 The authenticity of the June 28 Memorandum is also supported by a declassified set of three National Security Action Memorandums (NSAM) issued on the same day to the Joint Chiefs of Staff, and also forwarded to Dulles. NSAM 55-57 (below images) placed Cold War operations firmly under the control of the Joint Chiefs. According to Col Fletcher Prouty, they were Kennedy’s main means of gaining control over covert CIA operations. This supports the content of the June 28 CIA Memorandum which involved Cold War operations by MJ-12. 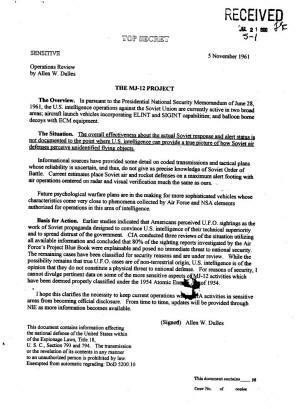 Furthermore, the three NSAMs help explain why the Joint Chiefs were included among the entities in the burned document’s first directive that would be excluded from UFO information. 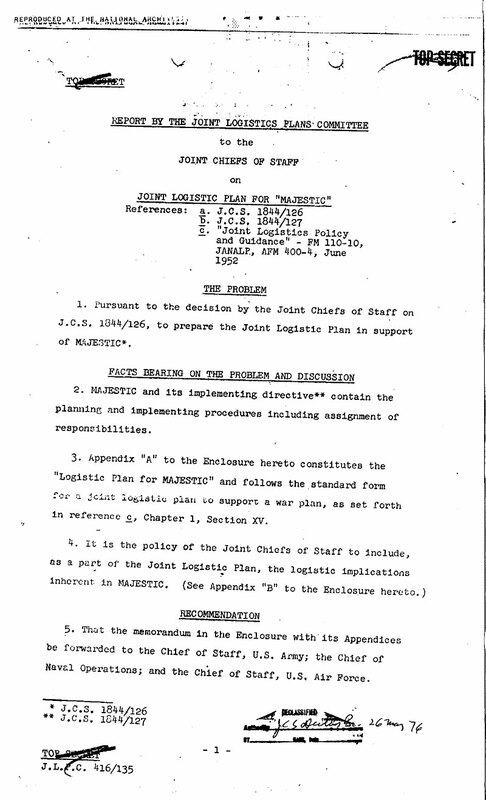 Finally, three 1952 Top Secret memos titled: "Joint Logistic Plan for MAJESTIC" (below images) from the Joint Chiefs of Staff were declassified in 1976. Once again, this shows the relationship between MJ-12 (Majestic) operations and psychological warfare. Kennedy therefore had good reason to issue his June 28 1961 memorandum to Dulles asking him for a review of MJ-12 psychological warefare operations. 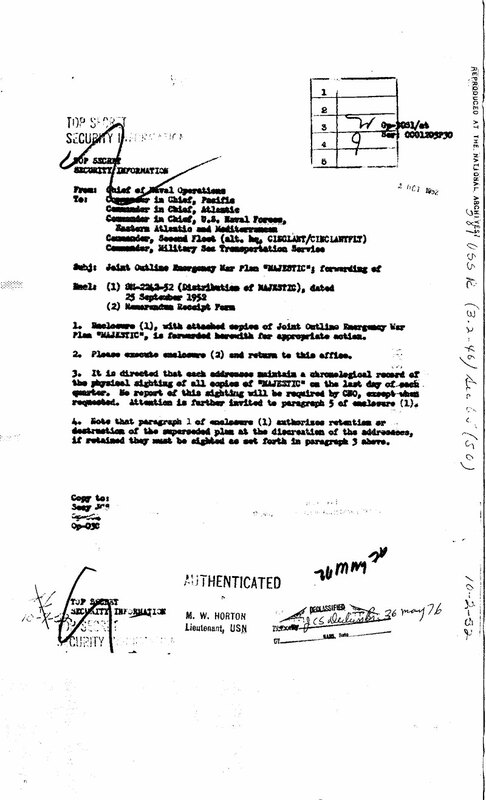 Dulles response to Kennedy’s June 28 Memorandum was an alleged letter marked TOP SECRET (below image) that was issued on November 5, 1961. 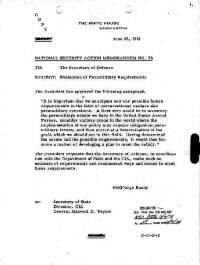 Dulles’ letter gives an overview of the MJ-12 activities with regard to psychological activities. 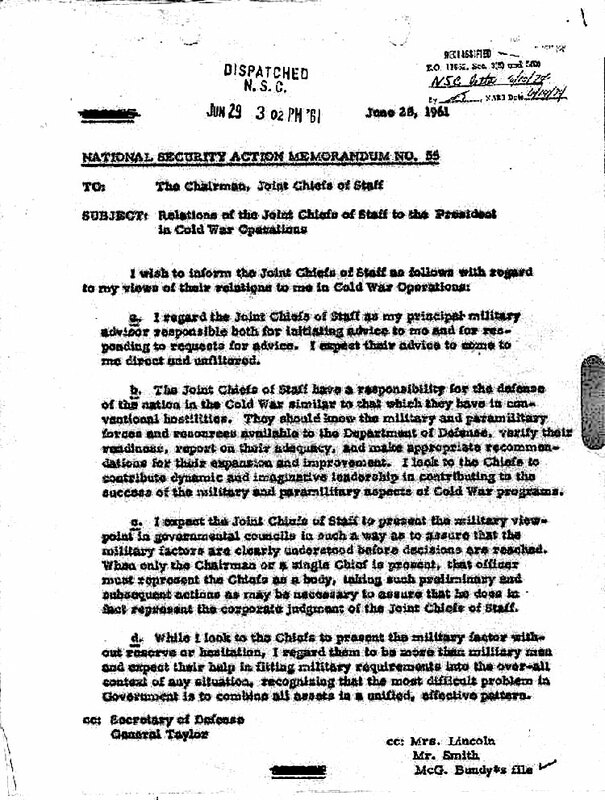 If genuine, Dulles’ letter was giving President Kennedy only minimal information in response to his June 1961 NSAM request for a brief summary of MJ-12 activities. 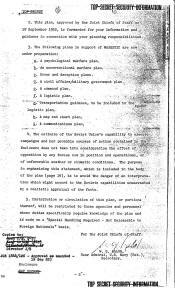 Consequently, the leaked June 28, 1961 Memorandum (above image), EO 10920 and NSAM’s 55-57 reveal that a power struggle was occurring over Executive control of Cold War psychological warfare programs and the covert activities of MJ-12. This struggle is reflected in the Burned Document which requests others involved in running MJ-12 to respond by October. 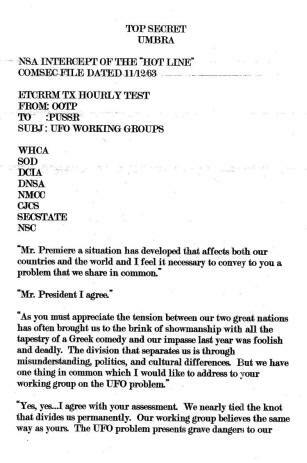 The response of other MJ-12 members presumably led to Dulles November 5 letter to Kennedy. The letter firmly suggests that MJ-12 had decided not to cooperate with Kennedy and authorized the set of directives drafted by Dulles. Thus Kennedy’s efforts to incorporate MJ-12 psychological warfare activities under the direct control of his National Security Advisor were dismissed. In conclusion, documents reveal that in 1961 President Kennedy was attempting to gain control over intelligence activities related to Cold War psychological warfare operations. This is confirmed in Executive Order 10920 that placed interagency psychological warfare plans under the control of McGeorge Bundy. It is further supported by declassified 1952 memos from the Joint Chiefs of Staff to provide logistic support for MAJESTIC (MJ-12) psychological warfare programs, and three NSAM’s issued on June 28, 1961 to place covert Cold War activities under the control of the Joint Chiefs of Staff. On the same day, June 28, Kennedy contacted Allen Dulles to request a summary about MJ-12’s psychological warfare activities. Dulles November 5 response highlighted that these activities involved the UFO issue but declined to release sensitive information. These events are consistent with the content of the burned document comprising eight directives restricting access to UFO information from the President, his National Security Council Staff, including Bundy, and the Joint Chiefs of Staff. It can therefore be concluded that Allen Dulles was the official who drafted the document including the cryptic assassination directive. Some time shortly before his alleged November 5, 1961 letter to Kennedy, Dulles draft set of directives had been responded to and approved by six other members of MJ-12. The implementation of the assassination directive on November 22, 1963 therefore constituted a covert coup d’etat by MJ-12.